Gurudev Nityananda was the idol of my adoration, the object of my saguna devotion, my saguna meditation, and my seguna deity. I worshipped him as Sita and Rama, Radha and Krishna, Parvati and Shiva, Guru Dattatreya. I saw all these gods as Nityananda. I had no thoughts for any other deities. I wasn’t even worried by the idea that ‘I haven’t taken the name of Rama, I haven’t worshipped Krishna, I haven’t meditated on Shiva.’ I believed that all Gods were contained in my Guru. I firmly believed that to worship the Guru was to worship all deities, that to meditate on the Guru was to meditate on all deities, and that to repeat the Guru’s name was to repeat the seventy million mantras. 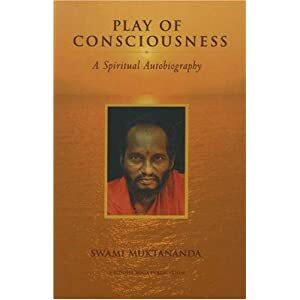 I had earlier visited sixty great saints, including Shri Siddharudha Swami, Srhi Zipruanna, Shri Hari Giri Baba, Shri Madivala Swami, Athani Shivayogi, and Shri Narsingh Swami and Shri Bapu Mai of Pandharpur, and I had heard the same thing from all of them: ‘There is no higher path than that of meditation on, obedience and service to, the Guru! He stood directly in front of me. He looked into my eyes once more. I watched him very attentively. A ray of light was coming from his pupils, and going right inside me. Its touch was searing, red hot, and its brilliance dazzled my eyes like a high powered bulb. As this ray flowed from Bhagawan Nityananda’s eyes into my own, the very hair on my body rose in wonder, awe, ecstasy, and fear. I went on repeating his mantra Guru Om, watching the colors of this ray. It was an unbroken stream of divine radiance. When you see the Blue Pearl all the time, this means that you are in the turiya state, the state of complete transcendence…Now I often saw a wonderfully luminous ball of light. It was much brighter than the other lights, and as I gazed at is, my meditation became better and better. As before, the four lights would appear first of all, and when the Blue Person appeared, my mind would converge on it for long periods of time, experiencing extremely joyful repose. My breathing became steady and shallow. When I breathed out, the breath would go only the distance of about two fingers from my nostrils, and when I breathed in, it would go down only as far as my through, never to my heart. However, I did not pay much attention to this for fear that my meditation should remain firm. During this stage, many divine fragrances came to me. They were so fine that compared with them even the finest scents brought to me by my dear devotees were dull and flat. There is no fragrance in the world to equal these divine fragrances, and they make me quite drunk. I floated in ecstasy—they were so divine. The experience stayed with me for a long time. With the coming of these fragrances, my breathing became very short and slow, and a special kind of pranayama took place spontaneously. When my breathing was like this, there around in me the most sweet and beautiful love. It felt like a direct, true revelation of God. Love is God. That is why Narada says in the Bhakti Sutras, anirvachaniyam premasvarupa, ‘Love is indescribable in its very nature.” With these experiences of the subtle levels, my enjoyment of meditation increased and increased. My mind was in such an extraordinary state that in every meditation I felt great joy and rapture, and every day this rapture increased so that the bliss of the day before seemed as nothing. I discovered that there is no limit to this kind of joy. Love grows steadily deeper, and there is no final point to love. With this experience I came to understand that there was still something ahead. Sometimes in meditation everything would abruptly changed. My eyes would slowly roll up and become centered on the upper space of the sahasrara. Instead of seeing two images separately, my eyes saw one. This is what is called bindu-bheda. Ah! What a great gift of Siddha Yoga! How mighty the power of Kundalini! What is understood intellectually through books and study can be experienced directly through Siddha Yoga.